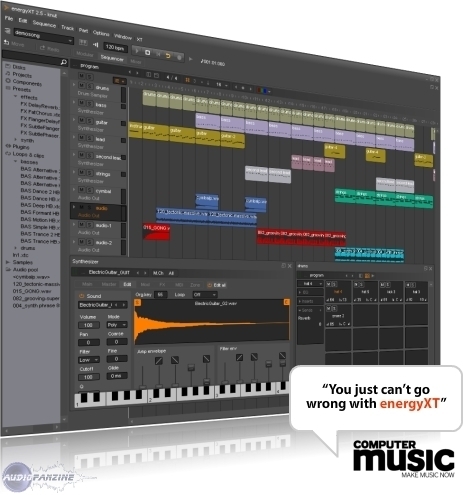 energyXT 2.5, Modular sequencer from Xt Software. XT Software has updated energyXT to v2.5.1. Export audio using multiple audio outs in project could crash, now fixed. VST version didn't include the default drum kit, now fixed. Will now load aif files in drum sampler and synthesizer. You can now drag & drop .xt files into energyXT to open projects. Snap settings in sequencer now saved with song. The samples section in browser didn't show mp3 files, now fixed. Fixed "MIT-SHM" error on Linux. It was possible to drag the main window behind the os menu on Mac OS X, now fixed. Click close main button on mac would prompt for save changes twice, now fixed. Added workaround for lame on mac, will now support having lame in energyXT folder. Undo text with audio process reverse and fade in/out was wrong, now fixed. Recording new part(s) didn't un-select already selected parts, now fixed. Insert note/MIDI event with mouse didn't copy the MIDI channel from the track, now fixed. Using ctrl-mousewheel to move faders is upside-down, now fixed. Changing the loop settings in the meter could sometimes make the track list scroll, now fixed. Scrollbars in modular view would reset wen changing view, now fixed and scroll pos is also saved. Song pos wasn't restored after render, now fixed. Drag-insert MIDI controllers didn't use the track's MIDI CH, now fixed. Create new sequencer manually in modular views and dock to new page would crash, now fixed. Load an .fxb file and the new preset name is not listed until you refresh its display, now fixed. Parameter changes (via automation or changing programs, for example) aren't shown in the display of a non-GUI plugin until you click on it, now fixed. Crash when attempting to paste MIDI notes into an audio part in the popup editor, now fixed. When an invalid project folder path is specified in Setup, saving a new file (without specifying a full path) fails, now fixed. This fix also applies to saving presets and clips. Crash when muting/unmuting a part on a frozen track during playback, now fixed. Having VST versions and standalone in the same folder causes crash when adding the VST into it (due to libaam.dll). "Bar" snap was always 4 quarter notes regardless of time signature, now fixed. Upgrading VST plugins where new version having more inputs and/or outputs than old version could lead to crash on older projects, now fixed. BTE Audio PEQ6 BTE Audio has extended its line of Equalization Algorithms with the PEQ6, a digital equalization algorithm designed to simulate the sound and feel of parametric equalizers. 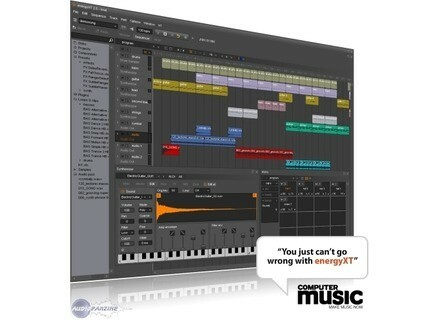 Mutools Mu.Lab Updated to v2.5.5 MUTOOLS has updated MU.LAB to v2.5.5. Loopmasters Drumdrops In Dub Vol. 4 This is the fourth installment in a series of re-mastered sessions from Horseman, which originally formed the complete Drumdrops in Dub volume 2 collection.